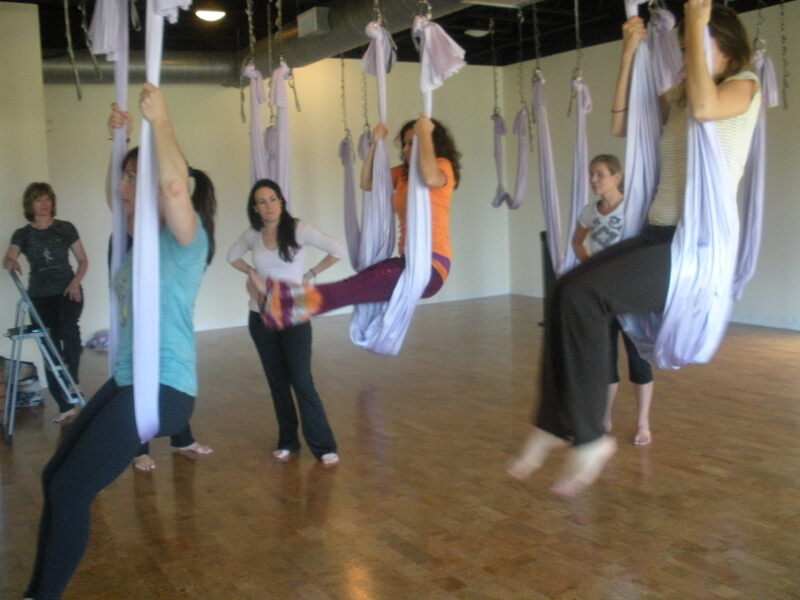 On Sunday, my dear friend Heather Ambrosi invited me and six of her friends to go to an anti-gravity yoga class at Launch Awareness in Kennesaw. After getting ever-so-slightly lost on the way over (when you go, check Google directions, and don’t rely on your GPS! ), we settled in for one of the most unique classes I’ve been to recently. We were all new to the practice, giving the feeling of playfulness and exploration. I’m fairly sure most anti-gravity classes are like this seeing as how there isn’t a huge cadre of practitioners yet, but it’s still a nice environment for everyone. 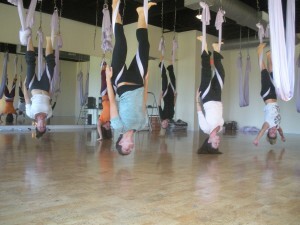 What makes anti-gravity yoga “anti-gravity” is that you spend most of the class suspended from a U-shaped silk. The silk is flexible but supportive, and allows for a lot of movement that you simply can’t accomplish standing on two feet. One signature part of this is getting upside-down. I find that what keeps me coming back to yoga are the seemingly endless possibilities for what the human body and mind can do. Would you have ever thought to try crow pose had it not been for a yoga class? Would you ever know the range of motion in your hips had it not been for your first pigeon pose…and then seeing what the fullest expression of pigeon looked like? And what about the first time you meditated in earnest? It certainly doesn’t end there, either. This class gave me that “new” feeling all over again. Every pose and movement was unlike anything I had ever experienced before. As an added bonus, it also got my blood moving–and eliminated the headache I had all morning. While there weren’t many “traditional” yoga poses, the essence of yoga was alive and well. The teacher, Kelli, delivered every movement with an in-breath or an out-breath and gave all of us space enough to feel into our bodies and let go of all of the thought that it took to get into the poses. Demonstrating that arm and ab skill! And then there was getting inverted. 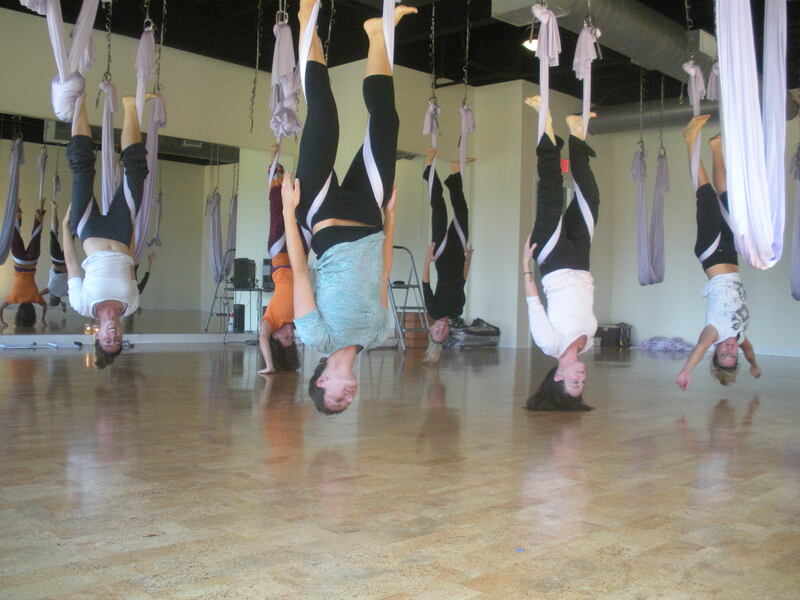 With the help of the silk apparatus, it’s easy for just about anyone to go upside down, and with the silk holding you up, you can really relax into the pose. This class could be really helpful to someone who hasn’t yet mustered the confidence to go upside down, but also for the person who is very comfortable upside down and who wants to play their edge in a new way. I strongly recommend some arm and abdominal strength before you get all crazy with the silks though, as it takes some gusto to push strongly enough to get up and inverted. Not so much that I couldn’t handle it, but enough that I felt my little chicken wings talking to me the next day! And don’t worry too much if you can’t make it out to Kennesaw anytime soon, I got a little insider tip that the owners of the studio are considering a couple of locations in the city, coming within the next year! Fun and exhilarating! The right blend of strength building and muscle lengthening…I could have stayed in savasana in that hammock a long time…very cool sensation. Add it to your list of things to try!